In the UK, the Zebra Home Training Mat is currently available from just one place, Fight N Fit MMA here in Bristol. You can either head over to their shop on 317 Two Mile Hill Road in Kingswood, or order online from the website. It's a fairly hefty £219 delivered, or (at time of writing) £199.99 from the shop, though that includes the no doubt equally hefty customs fees. In the US, Budovideos sells it for $249 here. They come in either black or blue. Full Review: BJJ outside of Brazil arguably began in a Los Angeles two-car garage, where Rorion threw down some mats in order to start teaching a small group of students. Several decades down the line, training at home is a luxury for some, who want to supplement what they've been taught at their local school. For others, it is a necessity, getting together a group of like-minded individuals because there is no other option for hundreds or even thousands of miles (though the latter situation is becoming increasingly rare). Back in Rorion's garage academy days, the surface would presumably have been judo tatami or perhaps wrestling mats, individual squares of padded material. 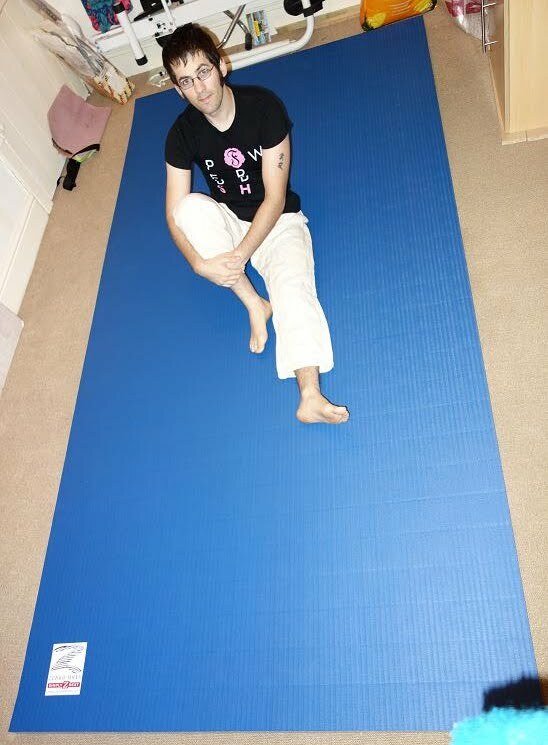 Anyone who has been training in martial arts a while, unless you've never done any grappling at all, will probably be familiar with dragging mats across the floor before class starts, then stacking them all back up in a cupboard. These squares are not portable, they slide around and you invariably catch toes and fingers in the gaps, at best tripping and at worst injuring yourself. They can also develop creases and cracks, which leads to multiple problems. It makes them more awkward to clean, as well as less safe for training. Just as gaps can snag digits, crease and cracks can do the same. Jigsaw mats are a slight improvement, as those gaps are less common, though the mats themselves tend to be quite thin. Having said that, jigsaw mats do have the considerable plus of a solid connection. The main downside is that it can be somewhat time consuming to combine all the mats, especially if you are trying to cover a large area. The market of people training in their garages, basements and living rooms has grown sufficiently large that there are now a number of different suppliers of portable, compact home training mats. 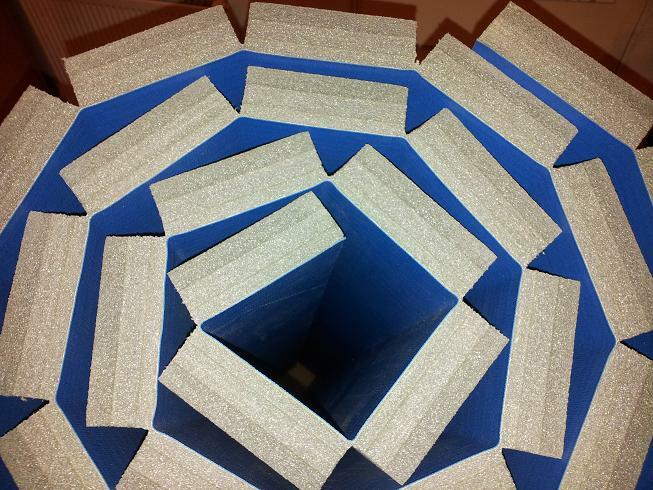 Among the most important innovations in that regard is the arrival of mats that can be rolled up, rather than having to stack them up in a pile. Being able to simply spread the roll onto the floor is much quicker than the laborious chore of laying out squares of mats. It is also a significant step up in convenience for transportation and storage. A floor mat with a seamless top surface and a segmented cushion layer. The seamless top surface eliminates gaps, crevices, and seams that may adversely affect performance or durability of the sports mat. 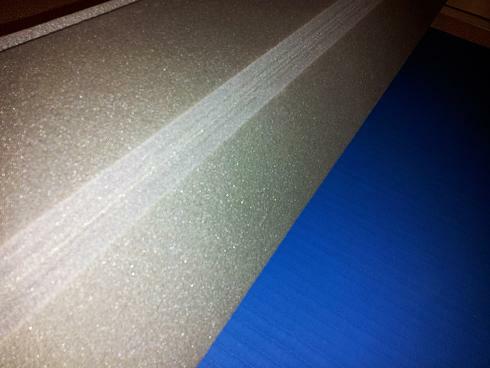 The segmented cushion layer provides an essentially continuous cushioned mat when the mat is in an unrolled configuration and reduces the likelihood of damage to the sports mat due to an exposed top surface or compressed cushion layer. The floor mat may be rolled up into a storage and transportation configuration without turning the mat over. The floor mat is also configured to permit one person to roll and unroll it. In the United States, the best known company is probably Dollamur (particularly after they bought their competitor, Swain, in 2008), for whom Heartsfield was working when he came up with the new process. Dollamur is mainly associated with wrestling, but it has also expanded to pretty much any sport that could require a matted surface at home (e.g., gymnastics, various striking styles and of course jiu jitsu). Rorion's Gracie Academy also has their own brand of mats, for the 'Gracie Garages' that pay homage to that original training set up, resurrected for Gracie Combatives. Jeff Rockwell's school uses yet another supplier, EZ Flex Mats who used to be part of Dollamur. The other major player is Zebra. In the United States, Zebra is one of several companies providing a roll-out mat. Here in the UK, they are your only choice. Until Fight N Fit brought in a supply of Zebra roll out mats this month, there was no choice at all. That scarcity goes a long way towards explaining the relatively high price. In the US, you could get roll out mats cheaper, but that doesn't take into account shipping, tax and customs to the UK, which for something that large and bulky is considerable. According to this interesting thread from a Canadian Zebra Mat employee, the standard Zebra mats are made in Germany, a fact of which that particular employee is very proud. However, the Zebra Home Training roll out mat is made in China. There is a commercial roll out mat (i.e., for use by wrestling teams, jiu jitsu schools, MMA clubs etc) made in the US, but that is not available online. When I trained at Rockwell's school in November 2012, I had my first experience of training on roll-out mats. Rockwell's location (he has two: the other is at the University of Texas) is an aerobics room in a fitness gym. It was impressive how that could go from a bunch of exercise bikes on a hardwood floor into a fully-matted jiu jitsu academy in a matter of minutes. The mats (from a company called EZ Flex) were stored elsewhere in three big rolls, which had been cut to fit the available area exactly. These mats also had one major advantage over the Zebra version: a velcro strip along the edges. There is a corresponding strip to go on top, meaning the mats lock together quickly and securely. This is something Dollamur does as well, dubbing it 'Flexi-Connect'. The Zebra roll out mat does not have any kind of attachment system. If you have more than one, you would therefore need to connect them with tape. According to some reviews, this can potentially became a tripping hazard, depending on how thick the tape is and whether or not the edges stay in place. Hopefully in future, Zebra will add some variant of the velcro innovation, as that is a far more reliable and convenient way of keeping the mats together. Naturally it isn't a concern if you only have one, but to do any serious sparring, you would need at least two mats. Still, tape can be a long term solution if you aren't planning to keep moving the mats into a storage cupboard or elsewhere after training. For example, the mats at Revolution Dojo were held together with tape, which is true of numerous other gyms I've visited. A few of those same reviews I've read have mentioned that without locking down the roll out mat in some way (such as nailing a wooden border around the edge), it will slide around every bit as much as traditional mats. I did not notice an issue with the mat I tested, but then that was in my lounge, so there wasn't much opportunity for it to move. This was also on carpet, which provides further friction: on a smoother surface, like a gym, school or community hall, it may not be as stable. The 5 x 10 foot size is also larger than I realised. I had expected I could just move a few chairs out of the way, but it actually involved pretty much clearing the room of furniture. Of course, I live in a Victorian terrace, which is not very large, especially by American standards. The Zebra Home Training Mat is therefore more than enough for your drilling needs. I could happily scissor sweep my girlfriend in either direction (though lengthways is of course preferable, as that is 10 feet rather than 5), along with a few cross arm and belt sweeps followed by mount escapes. If you stay relatively controlled, then you can spar on the Zebra mat too. My girlfriend doesn't train, so to test this I just told her to try and push me off the mat, whereas my goal was to stay put. We both remained on the mat, even when she forcefully kicked into my chest with both feet and threw me backwards. However, if you brought standing guard passes, scrambles and more explosive sweeps into the mix, there would not be space. I also wouldn't recommend full-power takedowns, though you could drill them lightly (e.g., a throw where you support them on the way down). The surface is very comfortable to roll on, every bit as good as the typical mats I've experienced at various clubs in the UK and USA. My girlfriend commented how she could imagine putting five or six people to sleep on them (though she meant that in the sense of people staying over after a party, rather than a boast of her awesome choking prowess ;D). When you roll it back up, you can keep it in place using a strap with a buckle, provided by Zebra when you buy the mats. The circumference when rolled is roughly 45cm. This is very important to note if you're intending to store your mat in the attic: I only just had enough clearance for mine. I carried it by hand from the academy to my house, which is a fairly short walk. That demonstrates that this mat is not especially heavy, because I'm small and weedy: if I can easily carry it that far, so can anyone. Given that this is a mat intended for training at home, you would most likely only be carrying it as far as your attic, storage cupboard or garage, or simple across the room. For transport further afield, a reasonably sized car should be sufficient, but you would of course want to check the dimensions first. 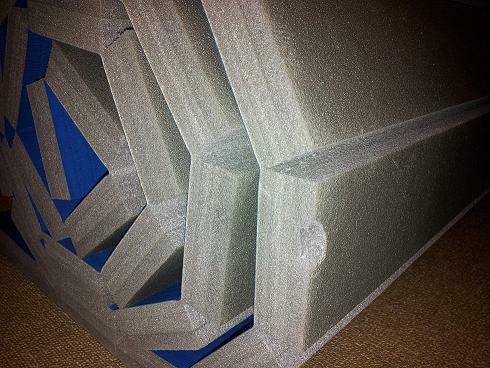 The foam on the bottom is not especially tough, so it will get scratched if you aren't careful. There was a large chunk bitten out of mine, which may have happened when I was carrying it back, or perhaps in transit to the academy. It also got some nicks on its way into the attic, due to the tight squeeze. Either way, you need to take care when moving your mat around if you want to keep it in good condition. The edge of the mat may rise up slightly after being repeatedly rolled up for transportation: it certainly did with the sample from the shop, which has been to lots of trade shows. As that's right at the end, if it did happen, I do not think it would impinge on training in a typical home setting. The main time where I could see it being a problem is if you had several mats and you wanted more than 10 feet, so laid them end to end. That rising edge would then have to be taped down, as it would otherwise (I assume, as I haven't been able to test this) be a tripping hazard. You have the choice of either black or blue for the home training mat, which Zebra does not recommend for commercial purposes (I assume the commercial mats are generally much longer than 10 feet and fitted to the relevant space, to avoid that rising edge problem). If you're actually running a class, then I can imagine this would work fine. However, Zebra does provide other options for that market, which includes custom designs for the top of the mat (i.e., your school logo and the like). I would assume that is quite a bit more expensive, but perhaps there is some kind of wholesale option. In the UK, the Zebra roll out mat is currently available from only one place, Fight N Fit MMA here in Bristol. You can either head over to the shop on 317 Two Mile Hill Road in Kingswood, or order online from the website. It's quite expensive at £219 delivered, or (at time of writing) £199.99 from the shop, but then it would be a lot more if you had to get it shipped across the sea. If you live in the US, there is much more competition and they do not have to ship so far, meaning a lower price. Budovideos sells Zebra Home Training Mats for $249 here, for the 5 x 10 foot version. One thing which is important for US customers is that in addition to multiple companies, each company also makes multiple types of surfaces, thicknesses, and sizes of mat should you need something less out of the box. 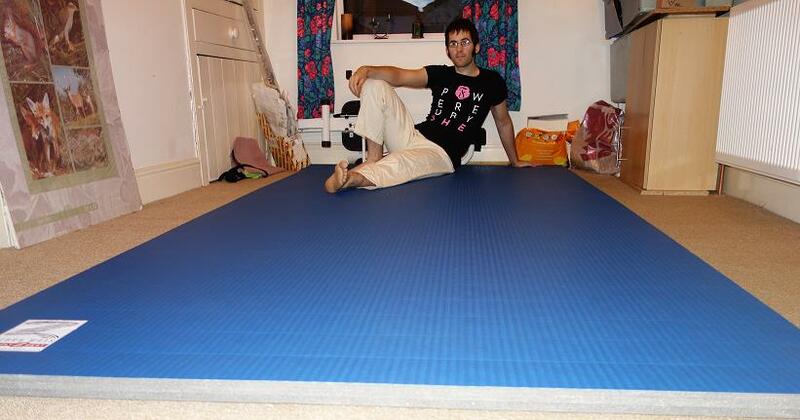 For example, my Dollamur mat is 3.6m x 3.6m x 5cm because I had a larger permanent space I could fill, and being able to practice full force throws and takedowns was important to me (I also built a sprung floor system for this purpose). On the note about the foam chipping/scratching easily - it will happen. If you're a US customer expect the bottom and sides of your mat to come with some nicks from shipping. Thanks Drew. 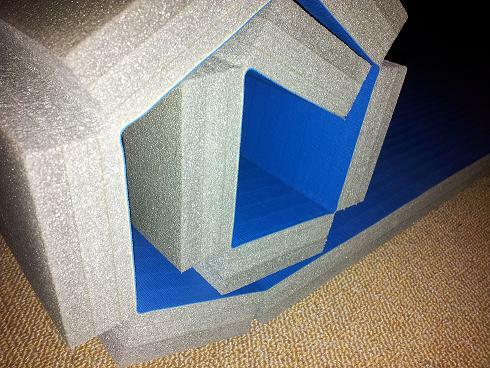 Out of interest, did your mats come with any kind of attachment system, or was it cut to fit the space? Will start to keep an eye on on these for when they pop up on sale. My mats came in two sections. Dollamur sells both 5' and 6' wide sections of any length you want. I then used the vinyl tape and VLP adhesive to semi-permanently attach the mats. The mats are held in place by the border from the sprung floor. The solution I took is only viable if you have a permanent space. I've seen the velcro work well, but they don't seem to have it for the thicker mats that I needed for judo. @Drew: Thanks for the info: yeah, having a border sounds like the best solution, as long as you have a permanent space. I think if I was going to get more than one mat, I would definitely want the velcro, particularly as I'm never going to be doing much in the way of takedowns. I was very impressed with how well that worked at Jeff Rockwell's club. However, that's only if there was a possibility of actually sparring with somebody regularly at home, or if I wanted to have mats to use to teach rather than just for drilling at home. @Megan: It would be worth keeping an eye on EZ Flex and Dollamur too, if you're looking to buy more than one. As per above, if it was me I'd want the velcro fastening system. The ZEBRA Home Roll Mat can come with mat tape, at an extra cost. Just go on the web site.